Since I am a big fan of both guava and passion fruit, in my investigations I learned of a common combination from Hawai’i, even hearing it is bottled and canned commercially there. POG is passion fruit, orange, and guava. I also learned there is a debate whether POG is made with passion fruit or pineapple. 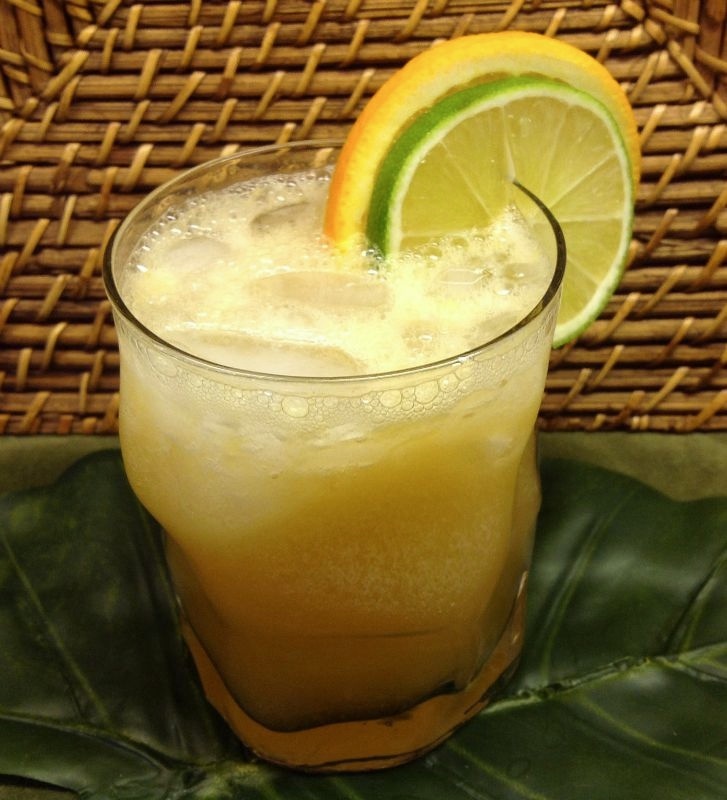 There seems to be more recipes made with pineapple juice, which makes sense since pineapple is as tropical as you can get, especially when thinking of Hawai’i. However, passion fruit won as far as accuracy and authenticity. There are many ratios of the three ingredients to choose from, understandably each is according to their creator’s preference in flavors. Orange balances, or its citric acid can takeover. Guava is mellow enough to get lost. And passion fruit is complex enough to stand on its own in almost any ratio. The goal balance is to match with the rum, but remembering lime will also get added (I add lime to almost all my tiki drinks – it goes with rum so well). POG is also meant to be drank all by itself. It’s so delicious and healthy tasting, I can’t help taking a big swig whenever I’m making any concoction with it (fighting the urge to chug all of it). Here is my POG recipe. But please experiment with the ratios to find your own flavor preference. Regarding the ingredients, if you only have syrups, not juices, halve the amount of syrup to juice, as I find syrups are generally twice as strong. It is not easy to obtain passion fruit or guava juices, even in the organic section of super markets. I ordered passion fruit juice online (Ceres brand – sounding closest to the true flavor of pure passion fruit, without as much filler to muddle the genuine flavor). As far as rum is concerned, Appleton has a very pleasing flavor, and goes gratefully well with POG. Yet I disagree with some that it should not be the only rum flavor in the punch. I am a big fan of Bajan rums, particularly Mount Gay rums (their entire line of products is excellent). A light rum from Barbados mixed with a golden Jamaican rum tastes complex enough, but simple enough to appreciate the wondrous flavors of POG. Lastly, my parents moved to Florida, and were loving enough to show me the wisdom of the local oranges. I know, you may think, “What’s the difference,” or “is it really that important?” The difference is bigger than you think, and yes – it is that important. When Florida oranges are in season, there truly is no better tasting orange on the planet (to me). They are not pretty to look at, and smaller, unlike the lovely California oranges, which seem less flavorful, regardless if they are more prolific year around. Of course commercial orange juice will work. I won’t go into detail about flavorings and preservatives added, merely stating that squeezing a fresh fruit will offer a better genuine flavor. Shake with ice. Strain into pre-chilled glass half-filled with ice. Garnish with an orange and lime slice. And for the record, this is one of my wife’s favorite drinks. However, I make a slightly different recipe for her. I use only Appleton (totaling 2 oz, and less lime & simple syrup – 1/4 oz each). It is a sweeter drink. I prefer drinks more sour, and alter her drink accordingly. After all, drink to your health, and your happiness, right? The first taste might cause you feel you are on a Hawai’ian beach.